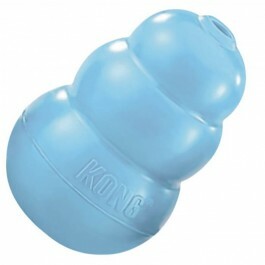 The KONG Puppy toy is made with Kong's exclusive teething rubber formula. The KONG Puppy toy is the original toy that started the KONG Puppy product line made with Kong's exclusive teething rubber formula. Veterinarians and trainers recommend stuffing the KONG Puppy with KONG Easy Treat, Snacks or Ziggies to aid in crate training, decrease separation anxiety, promote proper chewing behaviour and deter misbehaviour. The KONG Puppy Flyer is a flying disc perfect for games of fetch with your puppy.